Columbia Pro Baseball & The Bull Street Project Join Us On NHISG!!! Their Represenative Abby will join us and answer some of our questions about this exciting project and MLB Minor League team coming to our city. We want to welcome her ot the show and find out more. It is my pleasure to help bring more info to our listeners. The state-of-the-art multi-use sports and entertainment venue will be home to an affiliated professional Minor League Baseball team beginning in April, 2016. The team will begin taking reservations for ticket packages on February 2, 2015. Information and pricing will be available online at ColumbiaProBaseball.com and SpiritCommunicationsPark.com on January 27, 2015. “It’s exciting to think about how Spirit Communications Park will add to what is already one of the Southeast’s great cities,” said Freier, who was at a similar groundbreaking for Parkview Field in Fort Wayne, Ind., in 2007. Parkview Field has since been named the “No. 1 Ballpark Experience” in Minor League Baseball in three of the past four years. 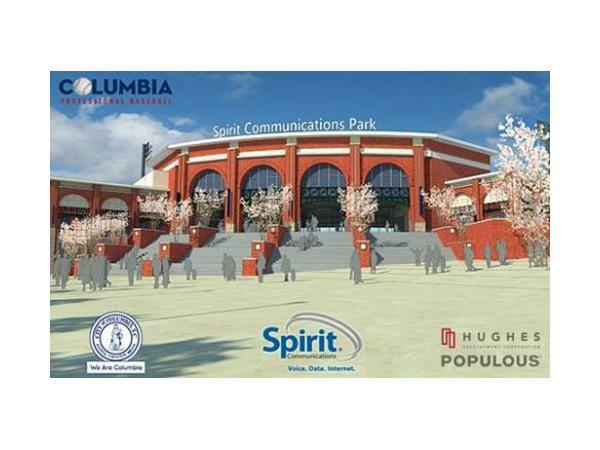 Spirit Communications Park will anchor development at Columbia Common, the new gateway to Downtown Columbia. The 181-acre Columbia Common, under the guidance of master developer Hughes Development, is primed to become the ultimate live-work-play community in the region.